For the March Career Newsletter, we’re spotlighting Monterey Institute of International Studies. The AmeriCorps program offers tremendous learning opportunities and work/life experiences—this is widely known. What doesn’t always get as much attention is what a perfect launching pad AmeriCorps service can be for future graduate school students who are looking to get their feet wet—and their hands dirty—in any number of careers related to community development and social change. For its part, the Monterey Institute of International Studies has a long history of partnering with organizations like AmeriCorps and the Peace Corps that offer participants the opportunity to work directly with local populations and service organizations. AmeriCorps alumni come to MIIS with a passion for community service and social change that prepares them well for programs such as the Master’s in Public Administration or the Master’s in International Environmental Policy. 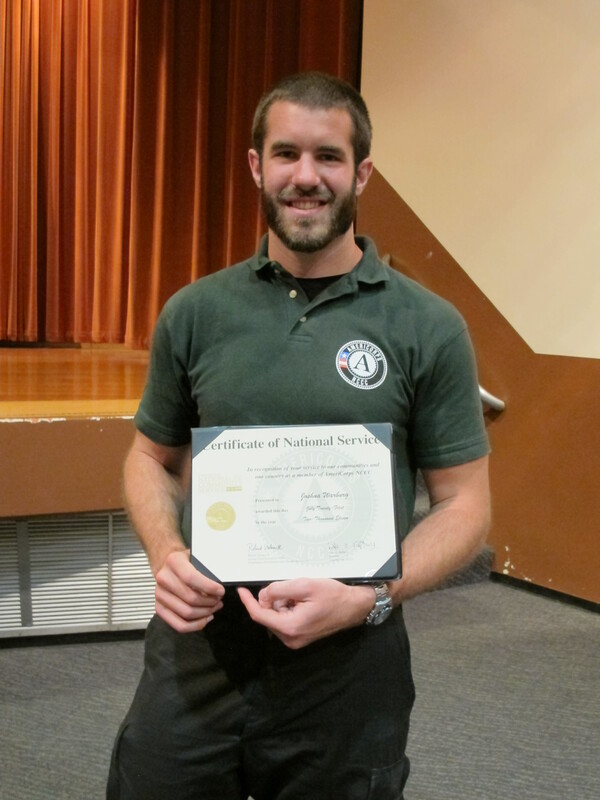 Looking for an opportunity to engage in public service but unsure of his long-term career path, current MIIS student Josh Warburg (MPA ’13) joined the AmeriCorps National Civilian Community Corps (NCCC) straight out of college after receiving a B.A. from the University of California, Davis. After 10 months of service projects that ranged from building houses in Wyoming with Habitat for Humanity to restoring a community garden at the Presidio of San Francisco, Warburg signed up to serve a second year with AmeriCorps as a team leader. Managing a group of 10 young NCCC members through six different service projects in the western U.S. helped to convince Warburg that his future lay in non-profit leadership. As he researched potential graduate programs, the Monterey Institute’s Master’s in Public Administration program stuck out for several reasons: the quality of the academic program, the practical focus of the curriculum, the diverse student body—and the Institute’s policy of matching the education award earned by AmeriCorps alumni dollar-for-dollar with institutional scholarship funding. Swartz spent a year with the AmeriCorps VISTA program working at New Orleans Outreach, whose mission is to serve and provide enrichment programs for underperforming public schools. The lessons Swartz learned in New Orleans ranged beyond the classroom, though. “It was also very eye-opening to me in terms of climate change,” he says. “Louisiana loses a football field of land every 30 minutes… My interest in climate change and global warming was what led to my interest in the Monterey Institute’s International Environmental Policy program. If it weren’t for the experience I had in AmeriCorps, I wouldn’t have made that connection and wouldn’t be where I am today.” Which is Geneva, Switzerland, where Swartz serves as the director for international policy of the International Emissions Trading Association. It often feels like you could draw a straight line from the AmeriCorps pledge to “get things done” to the Monterey Institute’s commitment to “be the solution.” Each organization sees community service and social change as an integral part of its mission, and each can play a vital role in helping young people transform into future leaders. Learn more about the new partnership between the Monterey Institute and AmeriCorps, and the AmeriCorps Scholarship available to qualified candidates.